Dominion has to do with control. Dominion has to do with rulership. Dominion has to do with authority and subduing and it relates to society. In other words, what the values are in Heaven need to be made manifest here on earth. Dominion means being the head and not the tail. Dominion means ruling as kings. It says in Revelation Chapter 1:6 that He has made us kings and priests - and check the rest of that verse; it says for dominion. So we are kings for dominion. "Right Wing Watch has a post today about the Religious Right's collective amnesia about Dominionism. Following the national attention given to the issue, there have been claims that Dominionism is almost nonexistent among the Religious Right, and simply a paranoid fantasy of liberal journalists. In response, Right Wing Watch had another post titled "If Dominionism Doesn't Exist, Someone Forgot to Tell the Dominionists." Peter Montgomery also had an excellent rebuttal to the denials at Religion Dispatches. Following is a collection of quotes about Dominionism and the "Seven Mountains Mandate" from various apostles and prophets of the New Apostolic Reformation." "What I do wish, however, is that these researchers would do the work to establish the long historical trajectory of movements like dominionism and NAR in relation to the longer history of Pentecostal and charismatic movments. None of what is happening now is new, it’s merely recycled teachings from the Latter Rain movement and “Holy Spirit”-led teachings. C. Peter Wagner is brilliant at it, and he has built on an old foundation with hundreds of books saying the same thing over and over again, and getting paid bank for it. When journalists discount the religious right it just tells me that they are still uncomfortable writing about religion; it takes work to understand the nuances of belief. What this brouhaha about dominionism and NAR shows is that there is a place for the naysayers and the dominionist researchers alike. What Rick Perry’s prayer rally did was to give all of this a big enough footprint in the media so that everyone felt comfortable pontificating about what they thought was going on, even if some journalists didn't get it. Not everyone there, as you say Sarah, was a dominionist. Everyone who participated in the fasting and prayer, however, did think it was important to pray for America and the particular moral issues they felt were relevant to their beliefs." "Somewhere between 1989 and 1995 some of us started to use the term Dominionism, especially after [Sara Diamond's book] Roads to Dominion came out. It seemed that for the Christian Right the influence of Dominion Theology had paved the path for their 'road to dominion'.... I have credited Diamond with popularizing the concept that there was a dynamic involving Dominion Theology and the broader Christian Right. So Diamond popularized the idea that seeking “dominion” was an important social movement dynamic inside the Christian Right. So arguably... I developed the term 'Dominionism' in a series of conversations that stretched over several years.... I began to use the term "Dominionism" in speeches and interviews to describe the broader tendency as distinct from 'Dominion Theology.'" Who First Used the Term Dominion/Dominionism? All of this leads to the bottom-line question. Who first used the term DOMINIONISM? Some of the semantic tap-dancing about this word ignores the fact that the root word of this is DOMINION, which is a biblical term found in Genesis chapter 1:26: "And God said, Let us make man in our image, after our likeness: and let them have dominion over the fish of the sea, and over the fowl of the air, and over the cattle, and over all the earth, and over every creeping thing that creepeth upon the earth." This is similarly repeated in verse 28 with the additional words, "And God blessed them, and God said unto them, Be fruitful, and multiply, and replenish the earth, and subdue it." Obviously, the Scripture uses the term "dominion." In its plainest literal sense this verse has traditionally meant that man is placed over God's creatures. But the Dominion (or "Cultural") Mandate teaches something very different from this. In all of its various forms, brand names, and theological streams it teaches that these verses have to do with the church exercising authority (sometimes called "influence") over the world system: society, culture and government. Who first taught it? When and where? To answer this completely would require a doctoral dissertation. To make it simple, we will list below some brief samples where the terms DOMINION or DOMINIONISM are used in the sense of this Genesis 1 "mandate." Paulk was also an early advocate of the Five-Fold Ministries concept, a teaching which C. Peter Wagner embraced as essential doctrine of the New Apostolic Reformation. Five-Fold is the belief that in the latter days apostles and prophets must be positioned as leaders in order for the kingdom to be established on earth, i.e. Dominionism. Furthermore, Paulk believed that the "way in which we will receive God's strategy for dominion is through angelic visitations as well as visitations from departed saints. "[emphasis added] The strange signs and wonders and manifestations that often accompany the NAR's version of implementing Dominionism are seen as a fulfillment of this impending Dominionism. This much publicized new paradigm can be traced to the Latter Rain movement of 40's and early 50"s. Even though the Latter Rain of the 50's faltered and fell into disrepute with the tragic death of William Branham and the repudiation by the Assemblies of God it was kept alive by certain survivors and reintroduced in a veiled manner into the Charismatic Renewal of the 60's and 70's. Few people have realized just how influential the Latter Rain movement was and how effectively Latter Rain concepts were introduced into the Charismatic Renewal. Ern Baxter who was instrumental in the Shepherding Movement, worked with William Branham during the 50's Latter Rain. George Warnock, who wrote the only systematic teaching from the Latter Rain (The Feast of Tabernacles), was Ern Baxter's personal secretary. In the midst of the Charismatic Renewal I remember well the teaching of the fivefold ministry and at that time assumed it was a new revelation to the church not knowing it had been imported directly from the Latter Rain. For more examples of early uses of the term Dominion and Dominionism teachers, see the compilation by Sandy Simpson titled "Dominionism Exposed" at http://www.deceptioninthechurch.com/dominionismexposed.html. So Sara Diamond can relax. Chip Berlet can relax. Rest assured that others used the term Dominion or Dominionism before the critics used it, and this go way back into the Latter Rain cult movement. Many observers of the Dominionism phenomena only watched the rise of Reconstructionism, which has such strident rhetoric that it is hard to miss. A few noticed Kingdom Now teachings. But few were aware of the multi-faceted streams of Dominionism that lurk in places like the stewardship environmentalists, the global prayer movement, the mission movement, the cultural renewal movement, the leadership training movement, the emergent movement, and especially the rise of the New Apostolic Reformation. What many don't realize is at the upper levels certain leaders of these various streams of Dominionism have been networking and associating with one another, and that this has been going on for many decades. Wagner has a gift for making the NAR's agenda of elimination of all other belief systems sound benign, as he speaks glowingly of a future without poverty, disease, and corruption.... Wagner does not specify how this utopian vision is to be achieved or the role that the demonization and scapegoating of others plays in bringing it about. The movement has developed a blueprint for justification of the demonization of others and markets it as love, charity, and social justice. (As a side note, I find it funny how this 1975 meeting came two full years after the original “dominionist,” R. J. Rushdoony, published his magnum opus The Institutes of Biblical Law(1973), calling Christians to get involved in the same areas a life. This book was in development for five long years while Rushdoony preached through the Mosaic law, applying it to every area of life. Bright and Cunningham were in the same area of California at the time. We also asked in a post several days later, titled "Neo-Kuyperian Spheres,"
Oddly, Gary DeMar's group seems to have forgotten that he once worked alongside the NAR Dominionists in their formative years as they together built the Coalition on Revival organization for Dominionist action on earth, starting with the American political scene. DeMar was on the Editorial Committee, and this group issued seventeen "sphere" documents that parallel the NAR's 7 mountains. Those current Christian Right pundits who say that dominionism (various forms of the belief that Christianity and biblical law should form the basis for civil laws which apply to everyone) doesn't exist are either unaware of their heritage or have selective memory.... Evangelicals who make light of the concerns are either engaged in damage control or suffering from amnesia. 1. This is a transcription of a recording of C. Peter Wagner delivering a speech to the 2008 "Starting The Year Off Right" conference. The YouTube location of this recording is http://www.youtube.com/watch?v=ecszOPc95s8. This is also posted at http://www.rightwingwatch.org/print/8018 where these words are transcribed. 3. Sarah Posner and Anthea Butler, "A journalist and a scholar of religion share notes on Rick Perry, the New Apostolic Reformation, and the recent brouhaha in the press about how much importance to accord to right-wing religion," http://www.religiondispatches.org/archive/atheologies/5026/beyond_alarmism_and_denial_in_the_dominionism_debate/. A overboard reaction against this article was authored by David French, "I'm a Dominionist? I Had No Idea," 9/1/11, http://www.nationalreview.com/blogs/print/276046. 4. Chip Berlet wrote the Preface for two of Russ Bellant's excellent books detailing the history and financing of the political and Religious Right: Old Nazis, the New Right, and the Republican Party (South End Press, 1991) and The Coors Connection (South End Press 1991). Russ Bellant spoke at a Discernment Ministries conference in 1997, after the publication of his third book The Religious Right in Michigan Politics (Americans for Religious Liberty, 1996), on the history of the rise of Charismatic Dominionism in the Word of God Church in Ann Arbor, Michigan which spawned the Promise Keepers movement. 5. Chip Berlet, "How We Coined the term 'Dominionism,' 8/31/11, http://www.talk2action.org/story/2011/8/31/17047/5683. In the full text of his comments, Berlet was also referencing Fred Clarkson, who wrote Eternal Hostility: The Struggle Between Theocracy and Democracy in 1997, and also used the term in this era. Earlier in the article Berlet refers to Bruce Barron's 1992 book Heaven on Earth? The Social & Political Agendas of Dominion Theology, noting that "Barron was worried by the aggressive, intolerant, and confrontational aspects of Dominion Theology; and was especially concerned that these ideas had seeped into the broader Christian evangelical community. Dominion theology is not a version of Christianity with which Barron is comfortable." 6. Matthew Poole's circa 1600s commentary on Genesis insists that this is a "permission rather than a command." In other words, there is no "dominion mandate." Matthew Poole, A Commentary on the Holy Bible, Vol. 1 Genesis-Job (Hendrickson), p. 5. See also http://herescope.blogspot.com/2007/07/secret-mission.html and http://herescope.blogspot.com/2007/07/cultural-mandate.html for more explanation on how modern variations of the Cultural Mandate doctrine were concocted. 9. See Al Dager's book Vengeance Is Ours: The Church in Dominion (Sword, 1990), pages 49-56, for documentation on Hall's influence. Also see the August/September 1998 Discernment Newsletter http://www.discernment-ministries.org/Newsletters/NL1998AugSep.pdf. Many of Hall's occult ideas are suddenly becoming popularized again. 12. Vengeance Is Ours, Ibid. 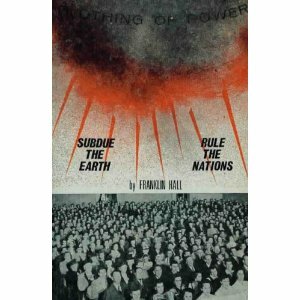 From Franklin Hall's Subdue The Earth, Rule The Nations," page 11. See article "Purging the Earth" posted at: http://www.apologeticsindex.org/l27.html#note32 This is a fascinating history of early Dominionism thought that influences the NAR to this day. 13. Vengeance Is Ours, Ibid., p. 102, quoting Earl Paulk, The Proper Function of the Church (Atlanta: K Dimension Publishers, undated), p. 13. The best guess is that this book was published by Paulk in the 1980s. 14. See Al Dager's lengthy account of Earl Paulk in his chapter on "Dominonism Teachings," Vengeance Is Ours, pp. 85-122. 19. Rachel Tabachnick, "C. Peter Wagner's Response to Increased Exposure of the New Apostolic Reformation," 9/9/11, http://www.talk2action.org/printpage/2011/9/9/133916/9724 Tabachnick is referring in particular to an interview C. Peter Wagner did with Voice of America at http://www.voanews.com/english/news/usa/Religious-Movement-Linked-to-Texas-Governor-Stirs-Controversy-129411833.html Regarding C. Peter Wagner's damage control campaign, see also: http://www.rightwingwatch.org/print/8084 ; http://www.charismanews.com/opinion/31851-the-new-apostolic-reformation-is-not-a-cult . 22. This is documented in a chapter in Vengeance is Ours, titled "Coalition On Revival: Putting Feet on the Dominion Agenda." There is considerable more factual information that could be added in at this point. The Dominionism family tree is very interconnected with many of the personnel from all streams interacting with each other for the past four (and more) decades.